Dr.Ratan Kumar Sinha, Chairman of the Atomic Energy Commission of India and Leader of the Indian Delegation to the 56th…. Power-starved India cannot give up the nuclear energy option, despite vociferous protests against it on the grounds of safety…..
Dr. Eric Loewen, President of American Nuclear Society (ANS), is also the Chief Consulting Engineer…. While it stopped short of a straightforward commitment, the joint statement between India and the US at the end of President…. 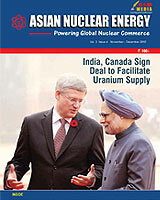 India’s Prime Minister Manmohan Singh has asserted that nuclear security is essential for harnessing nuclear energy…. While inaugurating a three-day International Conference on ‘Peaceful Uses of Atomic Energy-2009 held….